NOTE: These are three short vignettes on some shows/events at OHS. Use whatever information from each of these that works for you. There are photos (which will be sent separately) with most of these items below. “Oogui Sekai Ketteisen” – since you probably can’t speak Japanese, we’ll translate: “Battle of the Big Eaters World Championship” – which is one of the most popular TV shows on TV Tokyo in Japan. Based on the name, you’ve probably guessed – it’s a major league competitive eating show. Over 10 million people in Japan tune in to the show! Plus it is internationally syndicated because competitors are from the U.K., Australia and the USA. One of the competitions for an upcoming show had 2-member teams – one from Japan and the other from the USA – squaring off to see how many steaks each team could polish off in 30 minutes. With the stakes high, when Big Eaters and a Big Eating Championship need Big Steaks, the producers knew to come to Old Homestead Steakhouse! The producers asked us to provide 100 of our USDA prime dry-aged sirloin steaks for the competitors. 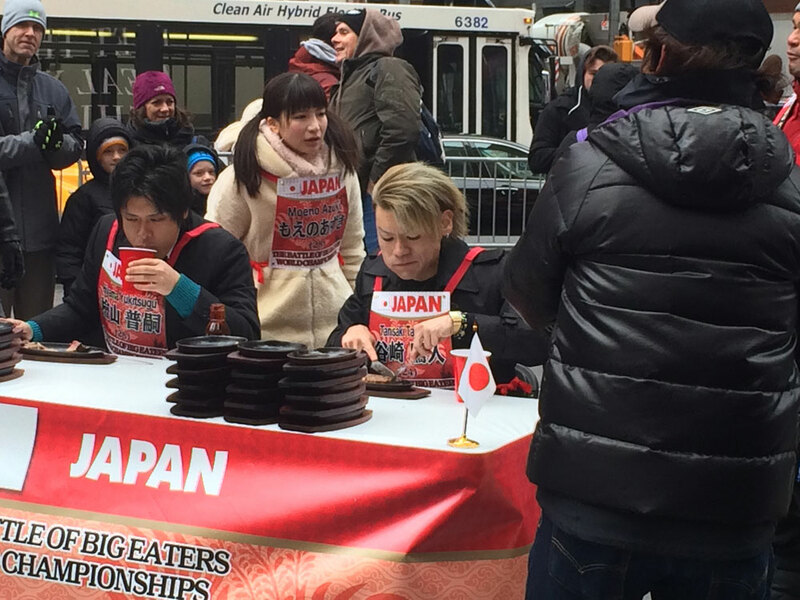 On Nov. 21, the championship was taped in Times Square, the crossroads of the civilized world, where the steak eating competition that pitted the USA vs. Japan was the main heavyweight event. Our staff was on-site and owner Greg Sherry served the ceremonious first plate. We can’t give away which professional competitive eaters hailed as the champions because the show doesn’t air until the end of the month. But let’s just say the competitors had more than their fill of steak and ate it, too! No one was seen leaving with doggie bags! In the words of George Steinbrenner, the late great owner of the New York Yankees, when you do good for someone, and more than two people know about it (you and the recipient), then you did it for the wrong reasons. So we tell you this story not to seek accolades, but to get you to open you wallets and hearts to a great organization called Dream on 3. Dream on 3 is a sports-centric wish-granting organization based in Charlotte, NC, for area kids with chronic illness, developmental disabilities and other life-altering conditions. We received a call from Dream on 3, asking us to host a 16-year-old and his family at the restaurant when they came to NYC. Jalen, a promising athlete who played high school football and basketball, was diagnosed with Stage 4 Hodgkin’s Lymphoma. Despite hailing from Charlotte, Jalen’s favorite hoops team is the hometown Knicks. His dream was to see his favorite player, Carmelo Anthony, play in person. Dream on 3 did one better. They got the Knicks to not only agree to provide tickets to a recent game. Jalen got to participate in a pre-game shoot-around with the team, including Melo. Of course, Jalen needed his strength. That’s where we came in. We hosted Jalen and his family for dinner. We were so delighted to be part of this VIP experience for Jalen. His family said it is just what the doctor ordered! And while he clearly was thrilled by the entire experience, the smile on Jalen’s face made our year! So you think your kids are a handful. Wait till you see the episode (shot at Old Homestead Steakhouse) of TLC’s “Outdaughtered” – the wildly popular reality show now in its second season that follows a young Houston, Texas-based couple and their quintuplet daughters – oh yeah, let’s not forget the quints’ 5-year-old big sister. The family was in NYC for a whirlwind press tour promoting Season 2. So the producers wanted to make sure they had dinner in the Big Apple’s best steakhouse. The couple arrived with a babysitter, grandparents and, of course, a carload of kids! We can’t reveal what happened during the dinner – you’ll just have to tune in to the show, whose new season starts early in 2017. But we can say this – the family said it was the best steak dinner they ever had. And that’s a lot coming from a family that hails from Texas! Maybe it’s those Texas-size slabs of USDA prime dry-aged juicy and succulent steaks that we’ve been serving forever! In case you missed it, Old Homestead Steakhouse has been featured on CBS Ch. 2 in a live food segment, and in numerous recorded segments on ABC Ch. 7, Wall Street Business Insider and many other media venues in recent weeks.